Sumiko soon discovers that the camp is on an Indian reservation and that the Japanese are as unwanted there as they’d been at home. But then she meets a young Mohave boy who might just become her first real friend…if he can ever stop being angry about the fact that the internment camp is on his tribe’s land. An excerpt from the book: Weedflower. Cynthia Kadohata’s father was held in the Poston internment camp during World War II. 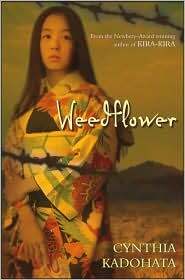 His experiences – and those of the tens of thousands of other Japanese and Japanese Americans – compelled her to write Weedflower. Characater – The main character, Sumiko, is compelling and well rounded. Her questions become our questions as we experience the war and life in the camp through her. Setting/Theme – The setting is an important part of the story. Most of it takes place in the Poston Camp. The ability for humans to adapt and create a “normal” daily routine in extraordinary circumstances is amazing. Set in America immediately before the attack on Pearl Harbor, this insightful novel by the Newbery-winning author of Kira-Kira traces the experiences of a Japanese-American girl and her family. Sixth-grader Sumiko, the only Asian student in her class, has always felt like an outcast. Early on, a heartbreaking scene foreshadows events to come, when Sumiko arrives at a classmate’s birthday party and is told by the hostess to wait outside on the porch, and is then sent away. The girl’s feelings of isolation turn to fear after the United States declares war on Japan. First, government officials take away Sumiko’s uncle and grandfather. Then her aunt must sell their California flower farm; they are transported to a makeshift camp and later to a Native-American reservation in Poston, Ariz. Living like a prisoner in the desert, Sumiko nearly succumbs to what her grandfather termed “ultimate boredom” (”that mean close to lose mind,” he explains). But Sumiko finds hope and a form of salvation as a beautiful garden she creates and a friendship with a Native American boy, Frank, both begin to blossom. The contrast between the Native Americans’ plight and that of the interned may enlighten many readers (”They take our land and put you on it. They give you electricity,” snaps Frank). Kadohata clearly and eloquently conveys her heroine’s mixture of shame, anger and courage. Readers will be inspired by Sumiko’s determination to survive and flourish in a harsh, unjust environment. Ages 11-up. (Apr.) Copyright 2006 Reed Business Information. Gr 5-8-When Pearl Harbor is attacked, the lives of a Japanese-American girl and her family are thrown into chaos. Sumiko, 12, and her younger brother, Tak-Tak, live with their aunt and uncle, grandfather Jiichan, and adult cousins on a flower farm in Southern California. Though often busy with chores, Sumiko enjoys working with the blossoms, particularly stock, or weedflowers (fragrant plants grown in a field). In the difficult days that follow the bombing, the family members fear for their safety and destroy many of their belongings. Then Uncle and Jiichan are taken to a prison camp, and the others are eventually sent to an assembly center at a racetrack, where they live in a horse stable. When they’re moved to the Arizona desert, Sumiko misses the routine of her old life and struggles with despair. New friends help; she grows a garden with her neighbor and develops a tender relationship with a Mohave boy. She learns from him that the camp is on land taken from the Mohave reservation and finds that the tribe’s plight parallels that of the incarcerated Japanese Americans. Kadohata brings into play some complex issues, but they realistically dovetail with Sumiko’s growth from child to young woman. She is a sympathetic heroine, surrounded by well-crafted, fascinating people. The concise yet lyrical prose conveys her story in a compelling narrative that will resonate with a wide audience.-Marilyn Taniguchi, Beverly Hills Public Library, CA Copyright 2006 Reed Business Information.